Don’t let crocheters have all the fun… knit up your own flurry of snowflakes! 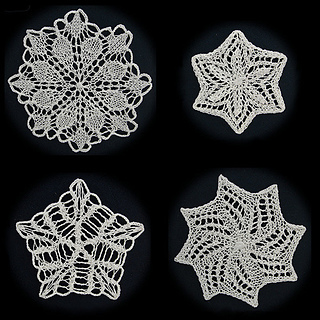 Each finished snowflake measures about 4 to 6 inches across, and takes between 15 and 25 yards of size 10 crochet cotton. This pattern is released under a Creative Commons Attribution-Share Alike 3.0 License. In short, this means that you ARE allowed to make and sell items made from this pattern, or other derivative works, so long as you give me credit for the original design, and make your own work available under the same terms. This pattern is written in English and all needle sizes, abbreviations, etc. are American. Contains 14 fully-illustrated pages.